On Saturday, March 8 at 10:00 a.m. on WQED-TV, QED COOKS with Chris Fennimore will bring the joy of the Italian Wedding Feast to its viewers. 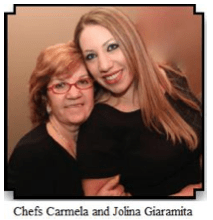 Carmela and Jolina Giaramita, chefs at Mount Washington’s family owned and operated restaurant La Tavola Italiana, will join Chris in the cooking studio to prepare a variety of authentic dishes served at an Italian Wedding Feast. The main entree will be a combination chicken and veal rollatini in a rich sauce and potato crostate on the side. There will be dessert and a festive Cookie Table with dozens of different sweet delights. Jimmy Sapienza and Five Guys Named Moe will provide LIVE music to sing and dance to. Couples will have the opportunity to renew their marriage vows and dance along to the first song from their wedding. It will truly be a night to remember. WQED changes lives by creating and sharing outstanding public media that educates, entertains, and inspires. It is the parent company of WQED-TV (PBS); WQED: The Neighborhood Channel; WQED: The Create Channel; WQED Showcase; Classical WQED-FM 89.3/Pittsburgh; Classical WQEJ-FM 89.7/Johnstown; the Pittsburgh Concert Channel at WQED-HD2 (89.3-2FM) and online at www.wqed.org/fm; local and national television and radio productions; WQED Interactive (www.wqed.org) and iQ: smartmedia, WQED’s Educational initiative (www.wqed.org/edu).